GALION — A familiar face in local law enforcement has retired. Lt. Lynn Sterling of the Galion Police Department gave 25 years of service to the community, including a year and a half as the School Resource Officer for Galion City Schools. She retired June 6. “Being a School Resource Officer was fantastic. I miss the kids already. I loved being around them,” Sterling said this week. Sterling provided security at the school campus along with education. This was the first time the school district and City of Galion had collaborated to provide an officer in each of the district’s buildings. And it didn’t take long for Sterling to make a difference. Sterling also organized the Galion Safety Town program. She is a Galion High School graduate who made the decision to pursue a career in law enforcement at a young age. “It was career day in middle school, and when I walked out of there that day I knew what I wanted to do,” Sterling said. Over the span of a quarter century Sterling has seen many changes in policing. “Technology has progressed. We used to write reports by and and now we have tablets in the cruisers. I loved serving the citizens of Galion. Sometimes it was challenging,” Sterling said. Her goal wasn’t to arrest people, rather it was to help them. As an SRO, she saw her role as one of support for the school district. “My role was anything that helped the school with their ultimate goal of teaching the kids. I would take kids home or pick up their parents for a meeting if that was needed,” Sterling recalled. In retirement, Sterling hopes to garden “and work in my flower beds.” She and her husband, Dennis, a retired police officer, also plan to travel. Law enforcement is a family business, as her son works for The Department of Homeland Security and her step-son is a police officer. “If I had to arrest a kid then I failed. My goal was not to arrest them, but to develop a relationship with them,” she said. “That was the best part of my career. I hope I was able to help people,” she said. 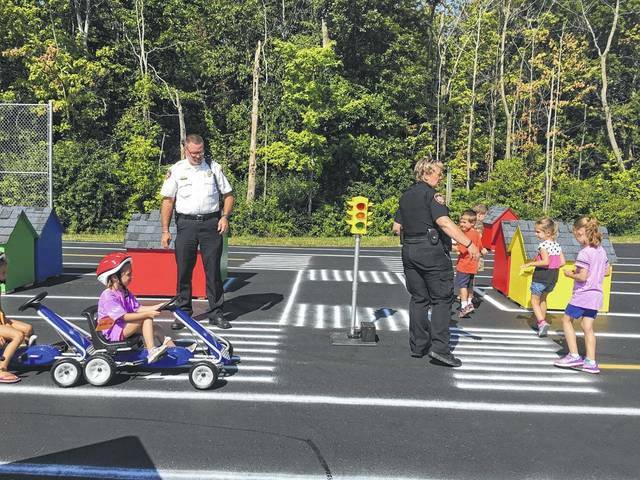 Galion Police Chief Brian Saterfield and School Resource Officer Lt. Lynn Sterling help children navigate their way through “traffic” during Safety Town last August.